When planning your trip, a portable power bank is a lifesaver and is one of the best phone and camera accessories in which you can invest. If you use your phone quite a lot when traveling taking photos and Instagramming your experiences with friends and family, realising your battery is running low and then going in a panic state trying to find a charging outlet. With a portable power bank that problem is something of the past powering your phone from your pocket, just remember to charge your power bank after use. A laptop is a great traveling companion, it’s very useful if you like taking photos and need to clear some space by transferring your photos from camera to laptop. The best laptop for traveling for us will be the Apple MacBook Air 11.6″. It’s thin, light and durable enough to take everywhere and powerful enough to do everything once you get there. For a camera that can take both beautiful photos and full HD videos we recommend the GOPRO HERO5. The camera itself may not look like much, but when it comes to footage this little shooter is professional-grade. In fact, the HERO5 is so reliable that it’s even used for high-end television shoots, it is however best for action scenes with an almost indestructible body case it will perform effortlessly in any weather conditions in and out of the water. If you travel with your laptop, you’ve probably run into issues connecting to a hotel or lodge’s WiFi. We recommend the TP-Link portable rooter. 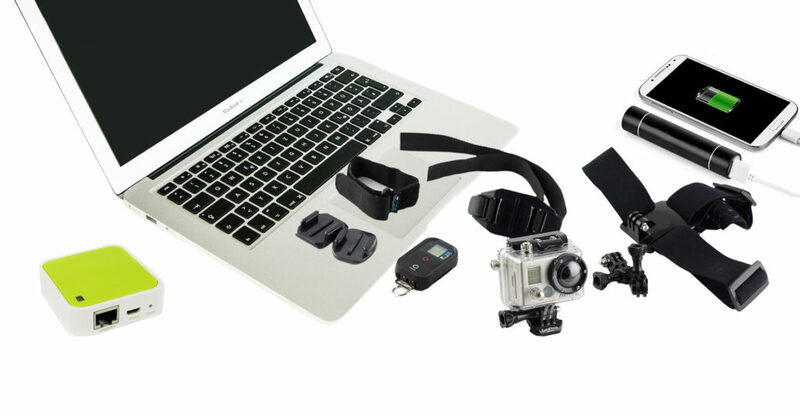 It is small enough to put into your pocket and take on all your traveling trips to share the Internet. When your hotel or lodge only offers a wired network connection, just plug the network cable into the TP-Link portable rooter and enter the default password to enjoy the convenience of wireless networking in your room. The last item we would like to mention is the Array 10W Solar Backpack. For people that loves to take hikes on their travels or just exploring a new city on foot this one’s for you. This solar backpack keeps your laptop, smartphone, and other small electronics charged up as you explore. The Solar panels on the back of the pack gets charged by the sun without you even knowing it’s there. You will never run into low battery devices again with this smart tech. This is only a small look into the technology available for travellers, but with these items you can be assure your travelling trip will be much more comfortable and less stressful.